Albert J. “Jack” Flaherty, Jr.
Albert “Jack” Flaherty of Woburn, October 12th, 2018 at eighty two years of age. Beloved husband of sixty years of Carolyn (Doherty) Flaherty of Woburn. Devoted father of A. John Flaherty III of Wakefield, Jane A. Flaherty, her companion Stephen Knight of Woburn, James E. Flaherty, his wife Stacy of Peabody, Paul A. of Medford, Peter T. his wife Sherry of Hampton and Patrick J. of Woburn. Dear brother of Robert P. Flaherty, his wife Barbara of Natick, Ellin Donahue, her husband David of GA, Judith Flaherty of NH, Francis Mooney, his late wife Ann M. (Flaherty) Mooney and the late Edward “Ted” Flaherty. Cherished grandfather of Kelsey, Kara, Nicole, Skyler, James, Danielle, Jack, Cyrena, and Grace. Also survived by many loving nieces, nephews, great and grand. A Funeral will be held from the Lynch-Cantillon Funeral Home, 263 Main Street, Woburn, Wednesday, October 17th at 9 a.m. followed by a Funeral Mass in St. Charles Church 280 Main Street, Woburn, at 10. Relatives and friends are respectfully invited to Calling Hours, Tuesday, 3-7 p.m. Remembrances may be made in Jack’s name to the Dana-Farber Cancer Institute, P.O. Box 849168, Boston, MA 02284-9168, to the Multiple Myeloma Research Foundation, 383 Main Avenue, 5th Floor, Norwalk, CT 06851, or to the Alzheimer’s Association 309 Waverley Oaks Rd, Waltham, MA 02452. For directions or to leave an online condolence, please visit www.lynch-cantillon.com or Facebook, under Lynch-Cantillon Funeral Home. Albert “Jack” Flaherty Jr., of Woburn, died peacefully, October 12th, 2018 at Aberjona Nursing Center in Winchester, surrounded by his loving family. The beloved husband of sixty years of Carolyn (Doherty) Flaherty of Woburn, he was eighty-two years of age. Born and raised in Woburn, Jack was a son of the late Dr. A.J. and Margaret (Murray) Flaherty. He was a graduate of Woburn High School, class of ’52 and received his bachelor’s degree from St. Michael’s College, in Vermont. Jack found his passion in education and received his Masters Degree from Northeastern University and continued his learning receiving a CAGS from Salem State. 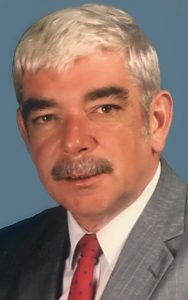 For over 35 years Jack served as an English Teacher and Department Head for the Woburn Public Schools. His love for learning and empowering others with knowledge, shone brightly both in the classroom and about the school. Jack was greatly respected and loved amongst his peers, students and really, anyone who had the pleasure of knowing him! Jack had founded the WHS newspaper “Tanner Banner”,and “ An Evening of Fine Arts,” which are two wonderful accomplishments that are still in existence today. Jack had a love for teaching and education and when it came to the trumpet, he was an outstanding musician with a tremendous love for music. He was a talented trumpet player and a member of many bands; “Jack Flaherty Orchestra,” “Larry Gilgun Orchestra” and “Us Three”, having also played solo. Not only did Jack play the trumpet but also the trombone and flugal horn. Jack’s greatest love though, was that of his family. His wife Carol and all his children were nearest and dearest to him. He was very active with his children, coaching their teams in church basketball, baseball teams, both minors and majors along with recreation basketball. He took great pride in all their academic, social, and sporting events. When his grandchildren arrived, there wasn’t enough time to spend with each! Jack shared a very special relationship with each of them individually and collectively as a group. Holidays, birthdays and any other cause for celebration was a very special time in the Flaherty household. Jack also enjoyed golfing, visiting the beach, and supporting his children and family in their various sporting activities. He enjoyed nothing more than being surrounded by family and friends. And in the summers, his house was the place for all of the neighborhood kids and friends to go swimming, play games, have good conversation and something to eat. Jack was an active guy who was involved in many, many extra activities all throughout his life; Board of Directors for Burbeen Lectures, President of the Woburn Retired Teachers Association, Board of Directors of MGH Aneurysem Foundation of MA, President of the Volunteers at the New England Rehab, on the Mayor’s Commission of Elderly Affairs and the Woburn Retirement Board. Carol and Jack were great travelers. School vacations and then retirement, allowed them time to spend in Florida, Europe, Alaska, also enjoying many Carribean Cruises. Jack was a man of great faith, honor and integrity. Life was very precious to Jack and he took nothing for granted. He worked hard all his life, provided dutifully for his family and kept the faith all the way to the end. Devoted father of A. John Flaherty III of Wakefield, Jane A. Flaherty, her companion Stephen Knight of Woburn, James E. Flaherty, his wife Stacy of Peabody, Paul A. of Medford, Peter T. his wife Sherry of Hampton and Patrick J. of Woburn. Dear brother of Robert P. Flaherty, his wife Barbara of Natick, Ellin Donahue, her husband David of GA, Judith Flaherty of NH, Francis Mooney of Woburn, his late wife Ann M. (Flaherty) Mooney and the late Edward “Ted” Flaherty. Jack is also survived by his sister in laws, Maureen Lacey Flaherty of Woburn and Ann Reardon, her late husband Edward of Cape Cod. Cherished grandfather of Kelsey, Kara, Nicole, Skyler, James, Danielle, Jack, Cyrena, and Grace. Also survived by many loving nieces, nephews great and grand. A Funeral will be held from the Lynch-Cantillon Funeral Home, 263 Main Street, Woburn, Wednesday, October 17th at 9 a.m. followed by a Funeral Mass in St. Charles Church 280 Main Street, Woburn, at 10. Relatives and friends are respectfully invited to Calling Hours, Tuesday, 3-7 p.m. Remembrances may be made in Jack’s name to the Dana-Farber Cancer Institute, P.O. Box 849168, Boston, MA 02284-9168, Multiple Myeloma Research Foundation 383 Main Avenue, 5th Floor Norwalk, CT 06851 , Alzheimer’s Association 309 Waverley Oaks Rd, Waltham, MA 02452. For directions or to leave an online condolence, please visit www.lynch-cantillon.com or Facebook under Lynch-Cantillon Funeral Home. Loved Mr. Flaherty, great family man and example for all of us and my all time favorite teacher. My condolences to my friend and teammate Paul and the great Flaherty family. I am so sorry to learn this news. Mr Flaherty was one of my favorite teachers, funny, smart and engaging. I remember having so much fun in his class. I also have many fond memories of you all on the hill when you were children. Rest in peace Mr Flaherty, you had a positive impact on so many. To the Flaherty Clan, my deepest condolences. Jack was a good guy and a good friend. Hope everyone is well. John – I am so sorry for the loss of your dad. I hope the wonderful memories you, your mom and brothers & sister have give you great comfort in the days and years ahead. Our condolences and prayers to the Flaherty family. The angels have another trumpet player. Rest In Peace Jack. May GOD watch over you Mr. Flaherty, a great teacher and a nice guy. Always very fair.